Top of the Pines @ Wilderness Ranch. 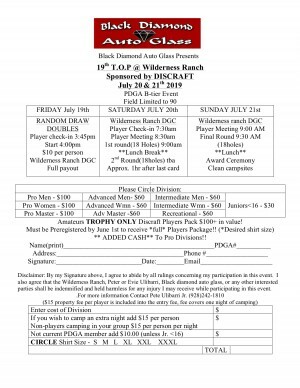 This years Top if the Pines disc golf tournament is going to be held at the lovely private disc golf course at Wilderness Ranch. The main goals of moving the event to this venue is to bring a worthy disc golf challenge to all skill levels on this all new Pete Ulibarri designed track and deliver a superb family experience with camping available as well as summer camp style bunk housing. Family amenities, Playground, volleyball court, basketball, swings. We aim for this years event to be a family friendly environment. All visitors to the property are expected to respect the property and others experience while staying by keeping music and other noises to a neighborly level. Property rules: No illegal substances. No smoking in any ranch building will be permitted. There is a designated smoking area by the fire pit. Violations will result in dismissal from the event. Smoking and campfires dependent on forest fire restrictions. There will be a Pro waitlist and an Am waitlist. If the Pro/Am fields do not fill by July 8th, we will fill any remaining spots with those on the waitlist in order. This years tournament entry fee includes a $15 property/camping fee. This covers camping or bunk a house bed for ONE person on Saturday night. If you wish to show up early and camp/stay Friday night, please add the extra nights fee at signup. If you have others in your group who are not playing in the event but camping with you, please check the appropriate box during signup. If you wish to bring an RV or Camp Trailer, please check the appropriate box at signup. 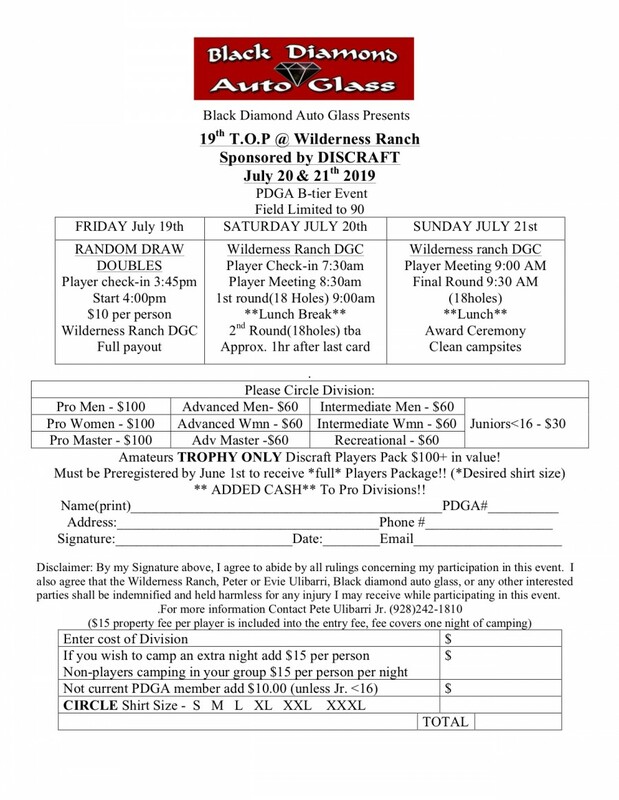 Please understand,Wilderness Ranch has graciously agreed that all revenue brought in from camping fees will go directly toward the disc golf courses maintenance and improvement. Our event is not only playing for the weekend but helping to improve the course for the future. Please check out the property rules page along with the bunkhouse and property tour, please check out. Team Uli is responsible for all refunds/cancelations. Approx. 1hr after last card is turned in. Clean campsites before you leave.